The Lebanese group, Hezbollah says one of its top leaders, Imad Mughniyeh, has died in a bombing in Damascus, and has blamed Israel for assassinating him. 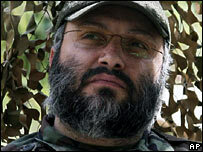 Mughniyeh is widely believed to be behind a wave of Western hostage-taking in Lebanon during the 1980s. He had been in hiding for years and was high on US and Israeli wanted lists. The Israeli prime minister's office later issued a statement rejecting "the attempt by terror groups to attribute to it any involvement" in the killing. Mughniyeh, in his late 40s, is variously described as special operations or intelligence chief of Hezbollah's secretive military wing, the Islamic Resistance. Correspondents say his death is a significant blow to Hezbollah, which battled Israel in the 2006 Lebanon war, and its Iranian and Syrian backers. Syrian police kept media and other onlookers well away from the scene of the overnight blast in the well-to-do Kafar Soussa district. Hours later, Syrian state TV confirmed one person had been killed in a car bombing, but did not identify the victim. "Scores of police and intelligence officers rushed to the site. People in the neighbourhood are shocked," said one resident quoted by Reuters news agency. "We saw security officers hauling the body away," said one witness quoted by Reuters news agency. Hezbollah-owned Manar TV in Beirut announced the death saying: "With all pride we declare a great jihadist leader of the Islamic resistance in Lebanon joining the martyrs... the brother commander hajj Imad Mughniyeh". "After a life full of jihad, sacrifices and accomplishments ... he died a martyr at the hands of the Israeli Zionists," it quoted a Hezbollah statement saying. Later, the Syrian government confirmed Mughniyeh had been killed and said investigations were still underway to find the perpetrators. "Syria, which condemns this cowardly terrorist act, expresses condolences to the martyr family and to the Lebanese people," Interior Minister Bassam Abdul-Majeed said in a statement. Iran also condemned the killing, praising Mughniyeh as a martyr and describing the attack as "yet another brazen example of organised state terrorism by the Zionist regime". Hezbollah said a funeral service would be held in its stronghold in the southern suburbs of Beirut on Thursday. The city has been tense ahead of a mass rally also on Thursday to commemorate three years since the assassination of former Prime Minister Rafik Hariri. There have been repeated clashes between supporters of the pro-Western government and the opposition, which includes Hezbollah. Hezbollah was founded in 1982 by a group of Shia Muslim clerics after the Israeli invasion of Lebanon. It has emerged in recent years as a major political and military force in Lebanon, after military successes against Israel. 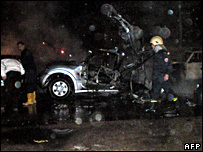 Shia militants who went on to become members are thought to have planned some of the most high-profile kidnappings and attacks of the 1980s, including the 1983 suicide bombings in Beirut that killed hundreds of US and French service personnel. Mughniyeh was among several suspects indicted in the US for the 1985 hijacking of a TWA airliner in which a US Navy diver was killed. Israel believes he was involved in planning the 1992 bombing of Israel's embassy in Argentina in which 29 people were killed, and the blast at a Buenos Aires Jewish centre two years later that killed 95. The Israeli government, which has been accused of a series of assassinations of its enemies in various countries over the years, stopped short of an outright denial that it had killed Mughniyeh. "Israel rejects the attempt by terror groups to attribute to it any involvement in this incident," Prime Minister Ehud Olmert's office said in a statement. Israel was still investigating all reports as they emerged, it added. But a former head of Israel's Mossad secret service, Danny Yatom, called the killing "a big achievement for the free world against terrorist organisations." A spokesman for the US state department, Sean McCormack, described Mughniyeh as a "cold-blooded killer, a mass murderer and a terrorist responsible for countless innocent lives lost". "The world is a better place without this man in it," he added. "One way or another he was brought to justice."